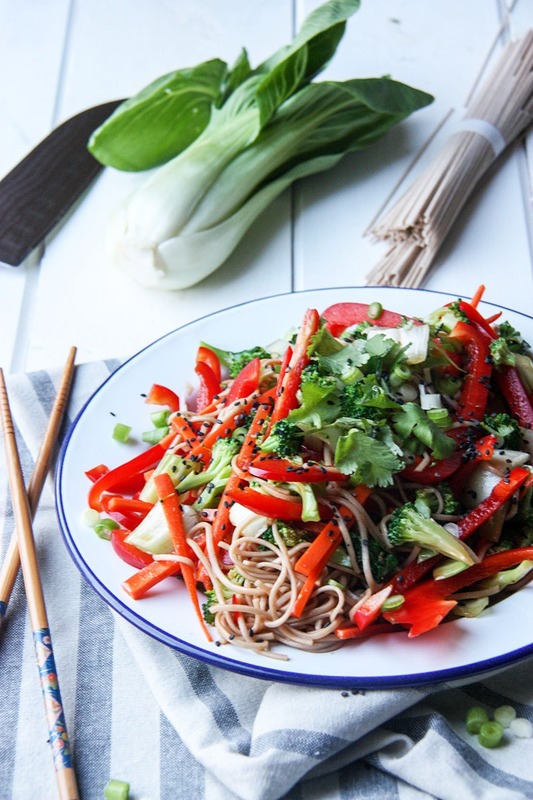 This Asian style, soba noodle salad is the perfect salad for when you are wanting something light, fresh and healthy! I’ve forgotten just how much I love soba noodles. They are legit the best type of noodle going around, and frankly, I don’t cook with them enough! For those of you who don’t know, soba noodles are a Japanese buckwheat noodle. They are super easy to cook, and are a perfect alternative to pasta, or other heavy Asian noodles. I’m currently going through, what I call, a bit of a health kick at the moment. Although there are no signs of it, summer is just around the corner here, which has made me have a bit of a panic about the state of my waist line. Too much munching over the Christmas break, and indulging in wine has got me feeling a little heavier, so I’ve been making a conscious effort to improve me eating patterns. The only issue with that, is that I am exercising more and CRAVING CARBS! I am so hungry, all the damn time! Hummus and carrots are just not cutting it when it comes to snacking, meaning I am coming home from work with the appetite of a young hippo. On Tuesday I was craving carbs, and something fresh, and remembered that I had a stack of Asian greens and veggies in the fridge, and some soba noodles in the cupboard. 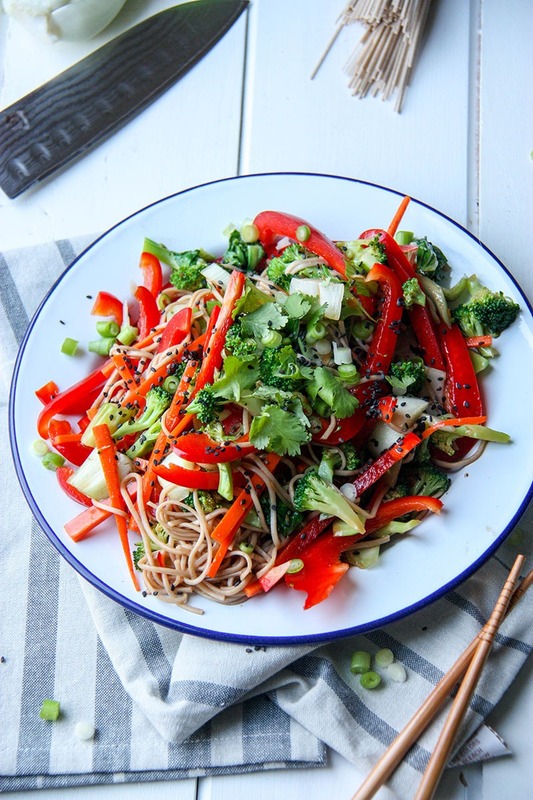 Thus the soba noodle salad was born. I paired this salad with a super simple Asian style dressing that you can easily adapt to taste. I made it twice – once with sriracha and once with sweet chili sauce. Being a chili sook, I much preferred the sweet chili sauce, even though I realise it probably has more sugar in it. But, #yolo a little sugar isn’t going to hurt. If you wanted to make the dressing cleaner, I’d swap out the sweet chili for coconut sugar and fresh chili instead. Although I haven’t tasted it, I’ve done salads with similar flavours before and it’s worked out well! Feel free to mix up the veggies you add as well. I was going to add snow peas, but didn’t have enough. I also thought about adding purple cabbage and edamame for a bit of extra oomph. 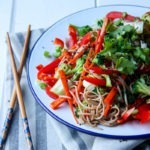 This soba noodle salad is light, healthy, fresh and ridiculously easy to make! If you're pushed for time, this salad is for you! Place cooked noodles in a large bowl. Garnish with sesame seeds, spring onion/green onion and coriander/cilantro. Note 1 - soba noodles are available in supermarkets in Australia and the US, and many good Asian supermarkets. They usually come in 3 portions, 90g/3.5oz is one portion of soba noodles. Note 2 - I am in love with grape seed oil at the moment and used that. Any other flavourless oil will do such as vegetable or canola oil. I haven't tried olive or coconut oil. I imagine olive oil may be a little too strong and coconut oil will give it a coconut flavour. Note 3 - I prefer steaming to boiling as it holds the nutrients better. Steaming will only take a few minutes for crunchy, crisp vegetables. Note 4 - One thing I've learnt, is that you really need to watch the cooking of the noodles. They take about 4 minutes and boil over so easily! Don't make that mistake, it's a lot of cleaning up. Note 5 - Julienne means to cut up kind of like matchsticks! Note 6 - to make a 'cleaner' sauce with less sugar, substitute the sweet chili for regular chili, and the sugar for coconut sugar. I love soba noodles! 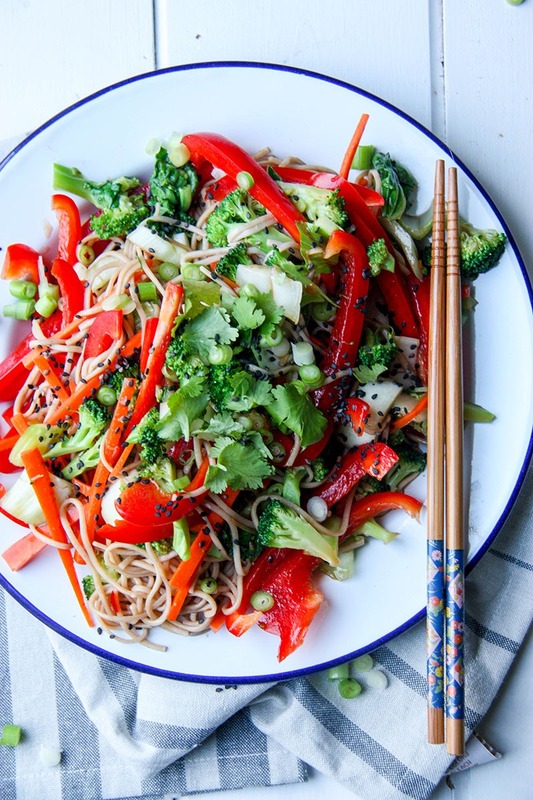 I make something similar with a peanut sauce…probably not the healthiest but hey it’s delish! Yum! This sounds so light and delightful! And that dressings sounds perfect! thanks for stopping by Corrine! yeah pretty happy about the dressing out of all of this recipe, really brings everything together nicely! 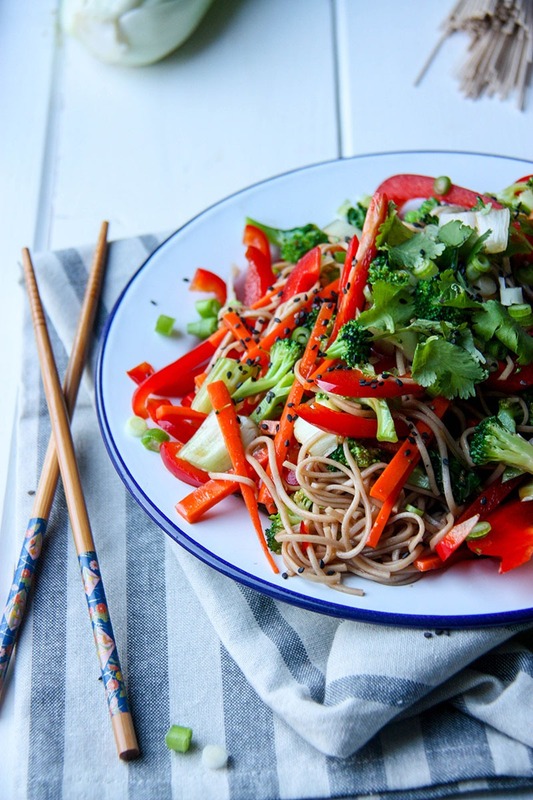 O such a yummy soba bowl! Being a celiac, my favorite soba noodles are these sweet potato buckwheat ones from King Soba…so good! Thanks for stopping by Evi 🙂 soba noodles are the best hey!